Are you sure it’s as much as 500 gms of flour? Mine are pretty solid so I wondered if 300 would have been plenty. PS the milk and spinach business is a bit of a fiddle! Hi is it ml or grams of the dry ingredients you add? Sorry for the late reply. I have used ml on dry ingredients but grams where appropriate. For example the spinach leaves are sold in grams so I used grams. Hi Graham, I wanted to make these muffins for supper tonight, but wasn’t sure what to do with the cherry tomatoes. Just chop and add? I will leave them out for tonight, but when I receive your reply I will know what to do in future. Oh Graham without you. 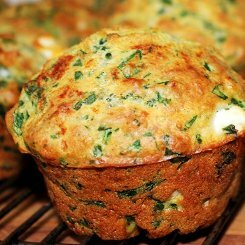 Speechless, Spinach and Feta Muffins. You’ve made my day. I made these muffins & they turned out bright green and looked nothing like your picture! They tasted nice but the colour was off putting. In fact my daughter couldnt stop laughing and thought it was so amusing that she put a photo of them on her. I put the milk & spinach mixture in a blender. Did I misunderstand the instructions?